Lensin - The population of Lensin was 279 in 1932. It covered an area of 30 acres and was a farm village. 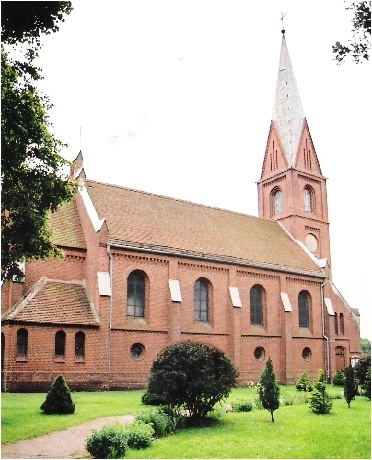 The Evangelical residents of the village attended the church in Wachholzhagen / Kirchhagen. 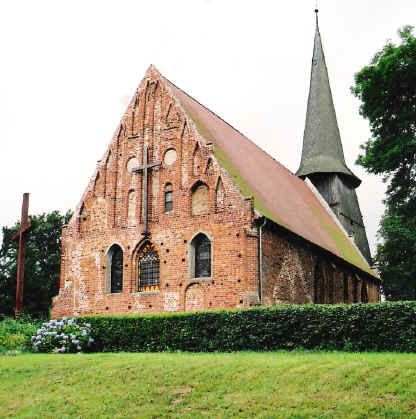 Loppnow - In 1932, there were 302 Evangelical residents in Loppnow. They belonged to the Bandekow parish. In 1655, the estate owner was Jakob von Loppnow. In 1870 there were 32 families which included 170 people. photo by Bill Ammons. Ribbekardt - The owner of the estate in 1655 was Wilhelm von Mildenitz. Residents in the village included Hans Knepel, Jochim Kikehefen, Michel Retzlaff, Jacob Boarke, Jochim Krüger, Jochim Vantzke, Maten Hannemann, Jürgen Schlenter, Jochim Laetzke, Hanß Köneke, Peter Millies and Hans Laboß. The population was 419. 269 were Evangelical, 131 were Catholic. photo by Bill Ammons. Robe - The picture on the left shows the exterior of the Evangelical Church in Robe, Kreis Greifenberg. 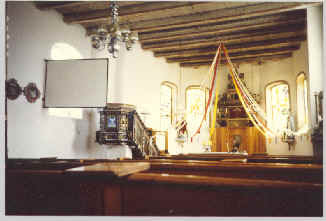 On the right is the picture of it's interior. 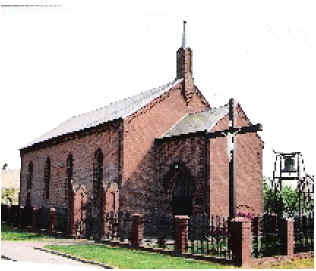 There were 544 residents in Robe in 1932 and the village had its own Evangelical Church, which they shared with Deep and Kamp. photos by Bill Ammons. Schmalenthin - covered an area of 23 acres, which contained 45 households. There were 257 residents, 231 were Evangelical and 3 Catholics. 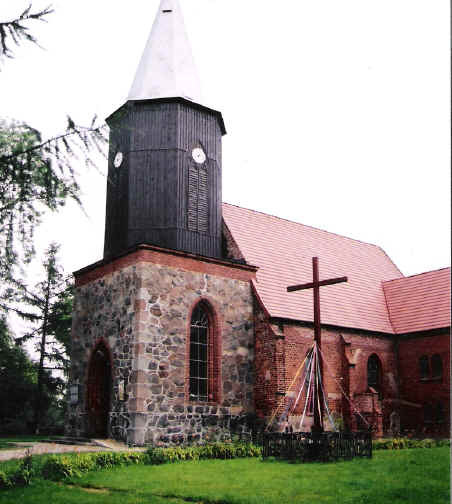 The Evangelical residents belonged to the Treptow Church parish. Schruptow - covered an area of 13acres. The population was 174 in 1931. Of these, 154 were Evangelical and 16 were Catholic. 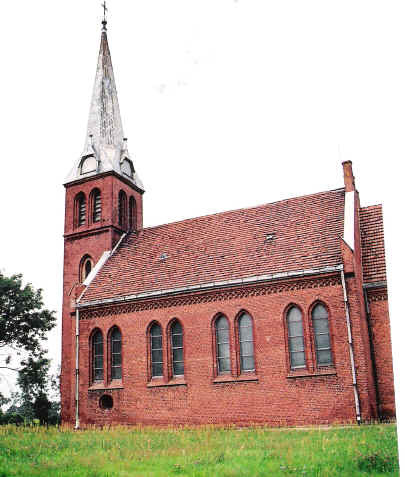 The Evangelical residents belonged to the Carnitz Church parish. 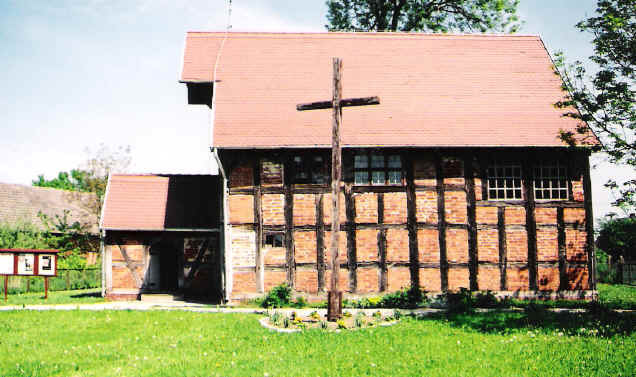 Schwessow - The population of Schwessow was 393 in 1925; of these 341 were Evangelical and 42 were Reformed Christians. 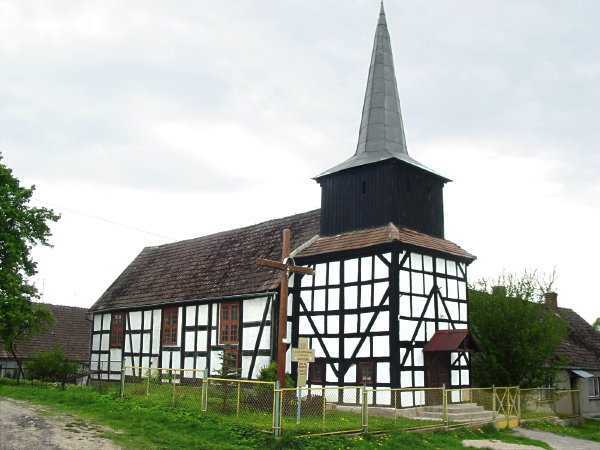 The Evangelicals were part of the Woistenthin, Kreis Cammin, parish in the middle 1800s. This church was built later. photo by Bill Ammons Triebs - The farming village of Triebs had a population of 571 in 1939. The village covered an area of 55 acres. 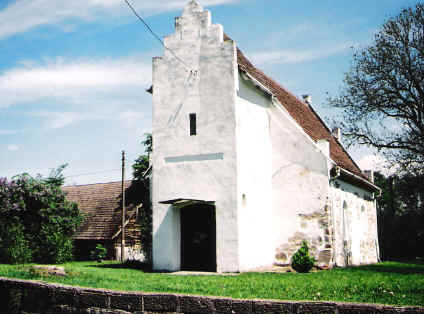 Evangelical residents of the village attended church in Trieglaff in the mid 1800s. This church was built later. photo by Bill Ammons. Treptow - (Treptow griffin at left) - Treptow existed as a small Wendish village as early as 1180. 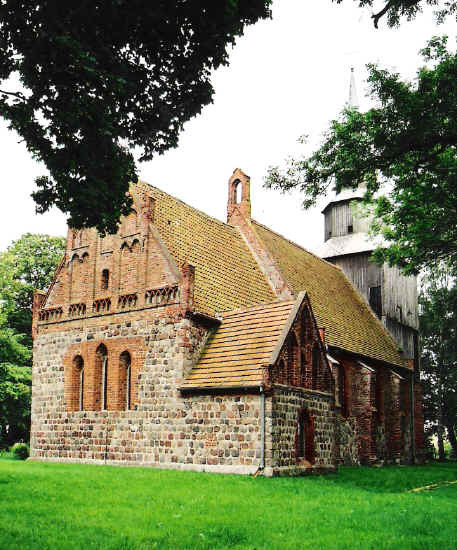 A town charter was instituted at Lübeck in 1280 and was confirmed in the year 1300. Historical documents mention the existence of a Latin school in Treptow in 1328. Treptow was also a member of the Hanseatic League which functioned in 1450. The Reformation was brought to Treptow by a very good friend of Martin Luther, Johan Bugenhagen, and from there it spread throughout Pommern. In 1932, there were 8149 residents in the city of Treptow-Rega and 7584 belonged to the Evangelical Churches; 114 were Catholic and 79 were Jewish. The medeval Treptow wall is seen at the upper right and the Treptow Rathaus on the lower right; The Treptow Church is at the lower left. Trieglaff - Covered 53 acres. The population was 494 in 1939. Resident surnames of the village included Sundram, Borchardt, Muhle, Kieckhafen, Thadden, Koch, Burmeister, Kannenberg, Grünwald, Runge, Uttech, Wrensch, and Callies. photo by Bill Ammons. 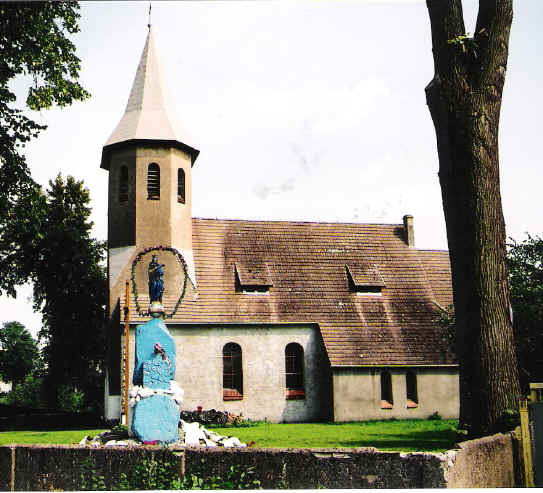 Voigtshagen - There were 577 residents in Voigtshagen in 1939 and the village covered 50 acres. There was a train station for the small railroad that ran through it. 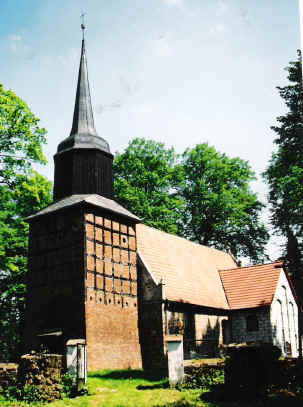 Originally, the Evangelical residents went to church in Klätkow. photo by Bill Ammons. 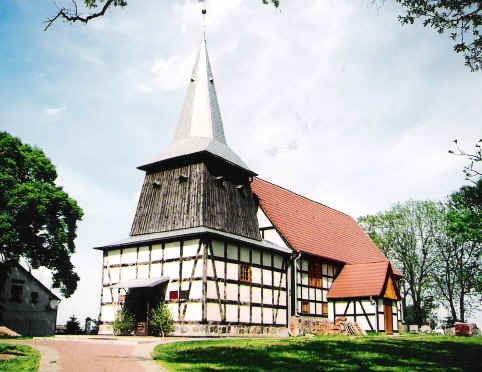 Wachholzhagen - was very close to Kirchhagen and was a part of the Kirchhagen parish. There were only 130 residents in 1925. The village was so near Kirchhagen that Wachholzhagen is seldom shown on a map. photo by Bill Ammons Wittenfelde - The owner of the estate in 1655 was Wilhelm von Mildenitz. Residents in the village included Jochim Lübbeke, Jacob klöhne, Jochim Kühle, Hanß Bruse, Marten Kannenberg and Carsten Drewes. Wödke - There were 360 Evangelical residents in the village of Wödke in 1931 and it covered an area of 42 aces. 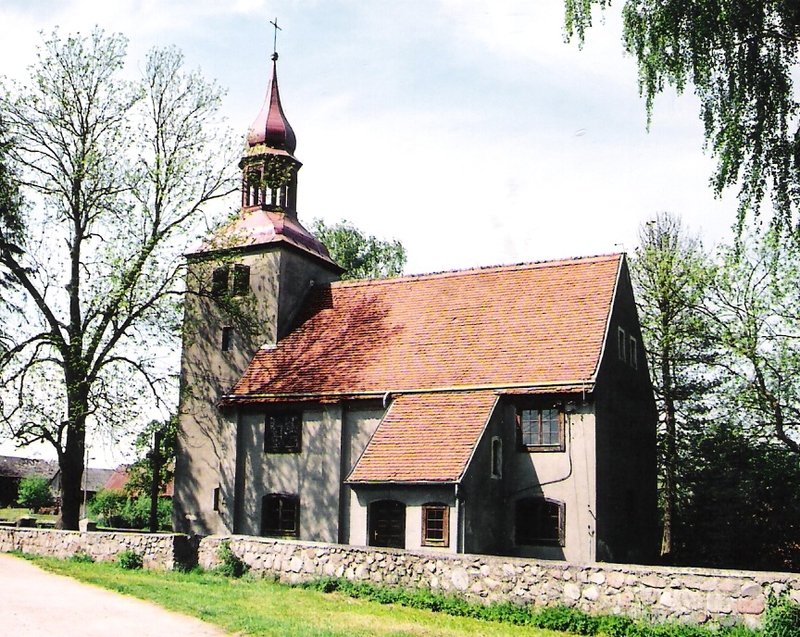 They belonged to the parish in Görke. 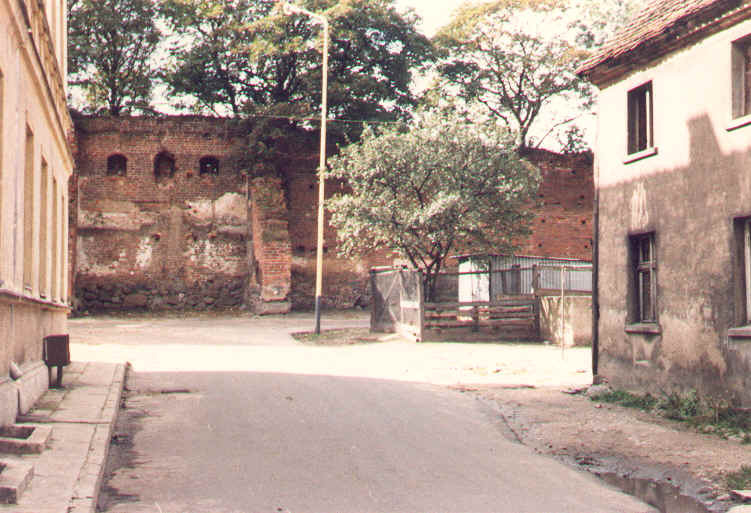 The estate owner was Peter von Wödke in 1655. photo by Bill Ammons. Zarben - The population of Zarben was 537 and 516 were Evangelical Christians. 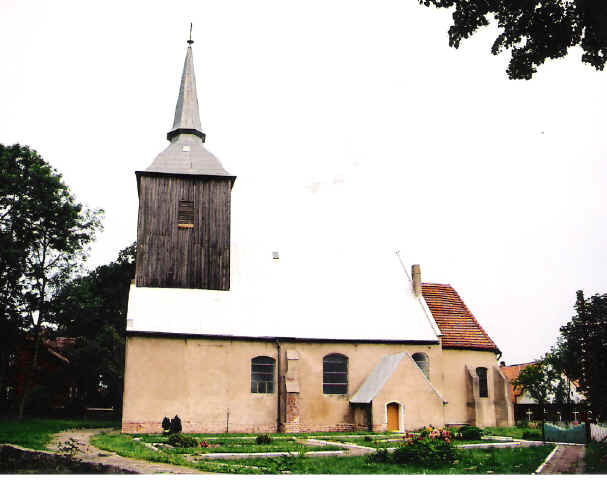 Zarben had its' own church, and the parish included Zamow, and Hagenow. photo by Bill Ammons. Zedlin - The population of Zedlin was 608 in 1939 and the village covered 8 aces. Klein Zapplin, Gross Zapplin and Gumtow shared the church with the residents of Zedlin. photo by Bill Ammons. 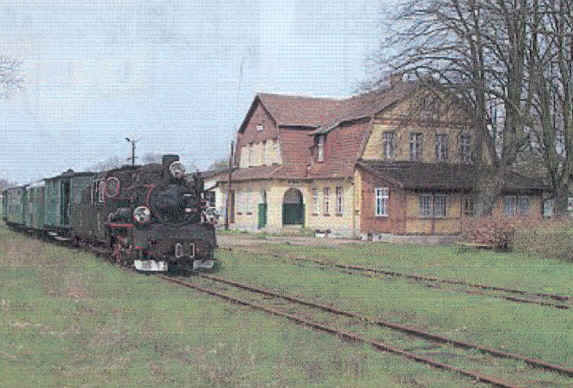 Zirkwitz - The population of Zirkwitz was 558 in 1931. 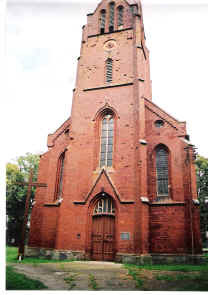 There were 535 members of the Evangelical Church of Zirkwitz and the 22 Catholic residents went to church in Treptow. The owner of the estate was Adrian von Wödke in 1655 photo by Bill Ammons. Zitmar - There were 322 residents living in Zitmar in 1925, 156 were men. There were 40 households and the area included 20 aces. 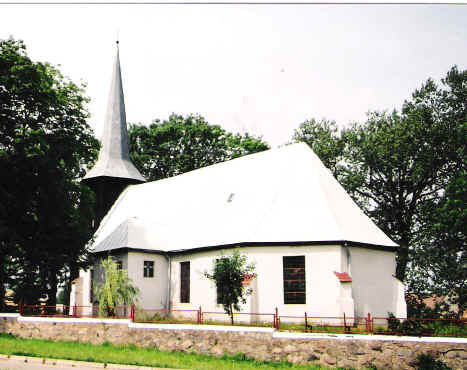 The residents of Zitmar were a part of the Zirkwitz Evangelical Church parish during the middle 1800s. 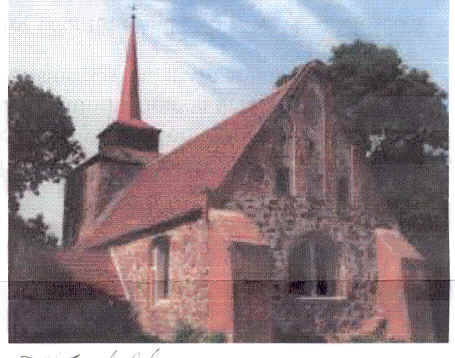 This pictured church was built later on. Photo by Bill Ammons.